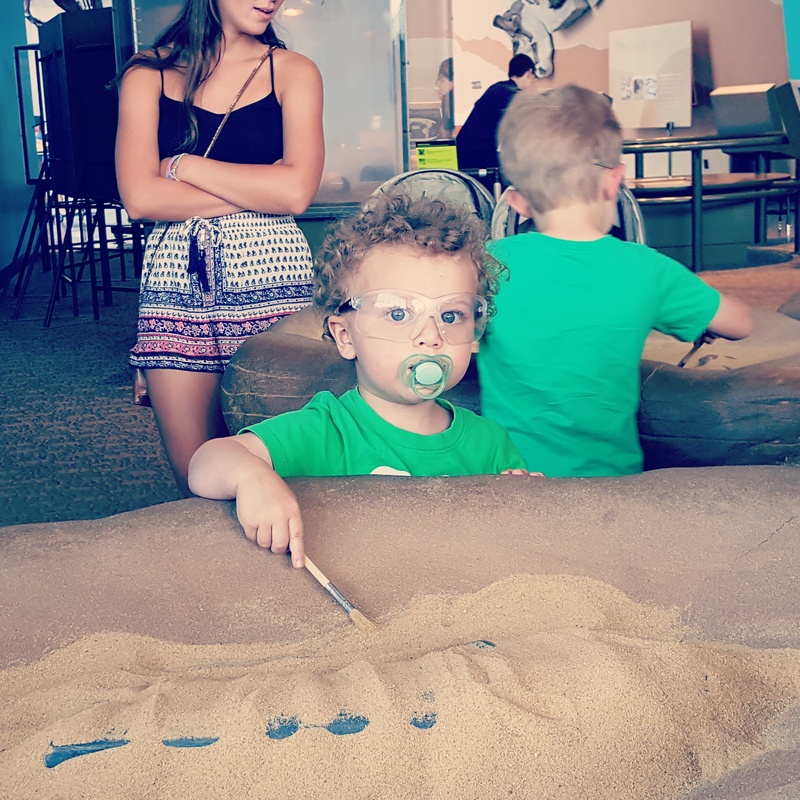 Yesterday morning I published a new post on the new blog, but then rushed my crew off to a fun day at the Maryland Science Center before I could post any links to it. We brought two teenage girl cousins with us, which I highly recommend to anyone considering taking four young children to a museum and waterfront and restaurant. Extra helpers for the win! Of course we came home late and then had to scramble to get the little ones to bed, and then of course I had to catch Mr. Donald J. (Why does he insist on that silly J?) Trump’s acceptance speech. Ugh. Is this really what’s become of us? Anyway! Before last night’s speech there were Wednesday night’s speeches (including Ted Cruz’s! So much intrigue!) and I wrote a blog post about them. Well, about them and the convention in general. And the downfall of the Republican Party. And Turkey. And the recent shootings of/by police officers. “Many say – and maybe they’re right – that Trump’s done so well because he’s been able to take advantage of white working class anger at such things. But he doesn’t deserve all the credit. Because it’s not all about those conditions. I think the Republican Party has had an outsized role in its own disruption/decline/dismantling/demise/whatever this is. The Party’s leaders, egged on in recent years by the Tea Party, have made hay by saying that “Washington” was the problem. Well, what did they think they were going to do when voters (understandably) decided that “Washington” includes Republicans too? And not just the old-school, committee chairman-type Republicans – the Tea Party types too. The Ted Cruzes. Head on over to the Catholic Review for the rest. A week ago, I was feeling a punchy sort of delight in the wackiness of that particular moment in politics. I was noticing a strange phenomenon in my media consumption (social and otherwise): cohesion. A sense of togetherness, a shared purpose. Half the nation seemed to be biting its collective fingernails over a common bogeyman: Donald Trump. I saw liberals pleading for their fellows to switch party affiliation so they could help select a more palatable Republican nominee. I saw conservatives pledging support for a third-party candidate or even (gasp!) 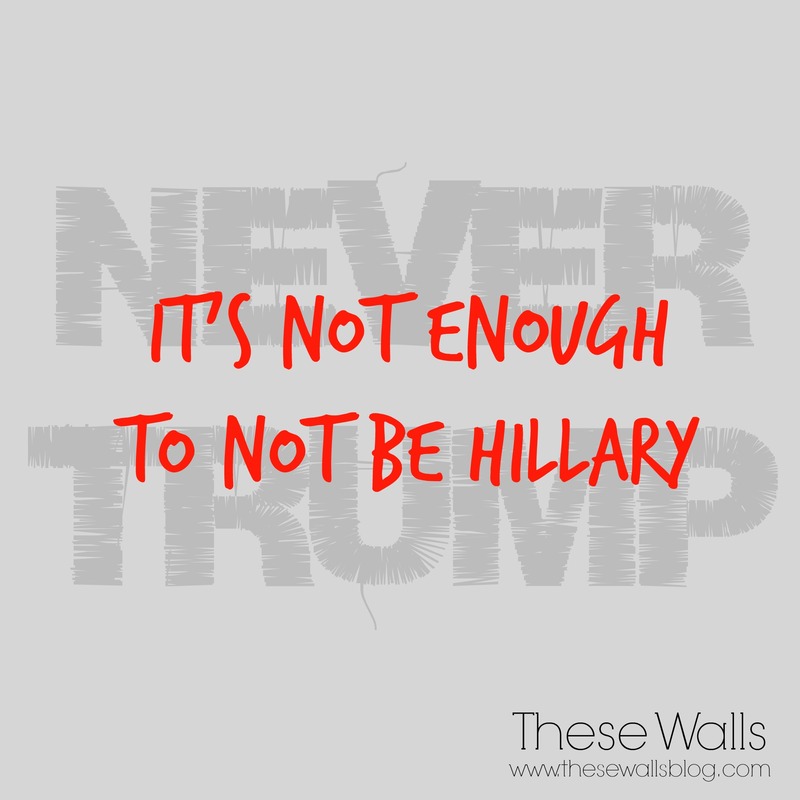 the dreaded Hillary Clinton should Trump receive the Republican nomination. I read solid cases against him and detailed strategies for ensuring he lost the nomination. I saw #NeverTrump, #AnyoneButTrump, #StopTrump, and #MakeDonaldDrumpfAgain. I read virtually identical anti-Trump Facebook posts from my most liberal and my most conservative friends. It seemed ironic to me that the thing to bring so many of us together across party and ideological lines was our shared horror at the thought of being governed by The Donald. Could Trump, in some backwards way, prove to be our nation’s great unifier after all? My poli-sci major brain was half-way giddy at the prospect. Today, though, those feelings have evaporated. All I feel is dread. I mourn the loss of Marco Rubio, my favorite of this year’s candidates. 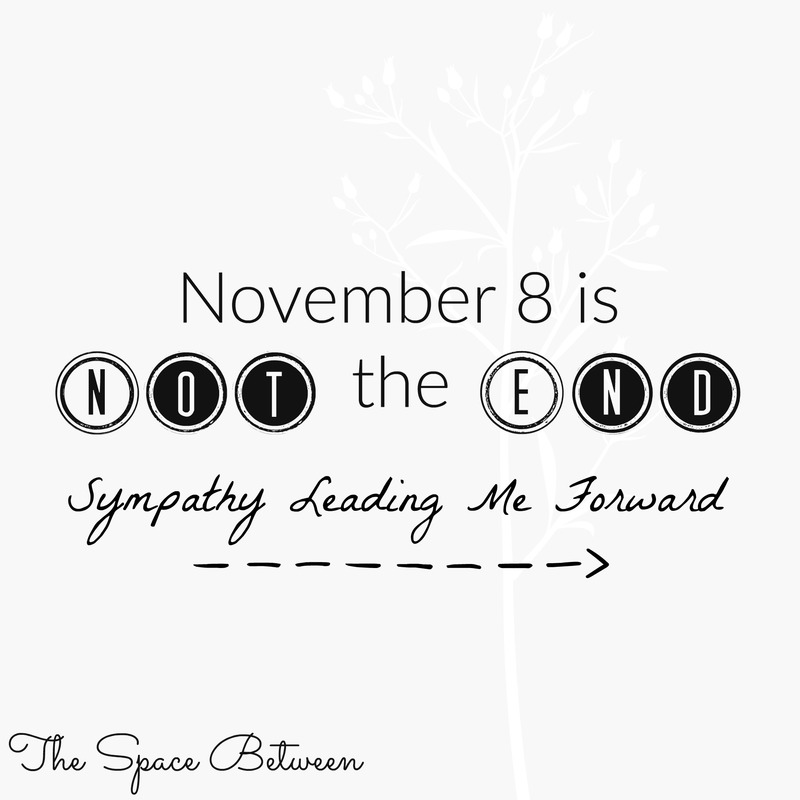 But more than that, I mourn the loss of the hope that somehow this race would turn around. That somehow the two-thirds of Republicans who disapprove of Trump would get it together well enough to settle on a strong, honorable candidate for the presidency. And that such a candidate would be able to work towards healing the Republican Party (and later, the country). Today, those hopes seem lost. More than that. Today, I think I’ve finally given up hope in the Republican Party. And that is so hard for me to admit. I grew up in the Party, wearing my Republican granddad’s campaign shirts at parades and fundraisers, urging my elementary school classmates to support George H.W. Bush’s campaign and my college classmates to support his son’s. I defended Reagan and Bush and Dole and Bush and McCain and Romney. I’m reminding myself that politics is, at its core, nothing more than the method by which differently-minded people work out how to govern together. And that political parties are nothing more than tools to make that process function more efficiently. There is nothing immutable about the way the two parties currently line up. Republicans used to be the big-government progressive party, formed in opposition to slavery and pushing to remodel the South after the civil war; they have also been the small-government party, not only now, but in opposition to the New Deal in the 1930s. Democrats were once the small-government party, opposing those who wanted a more powerful federal government and defending the interests of white southerners against Washington; now they are famous as the big-government party, pushing federal anti-poverty programmes in the 20th century and government involvement in health care in the 21st. Political parties are not religions. They are not nationalities. They are not perfect and they are not permanent. They are simply groups of like-minded people who band together in the hope of having more of a say in how they are governed. I am not obliged to support any one of them. 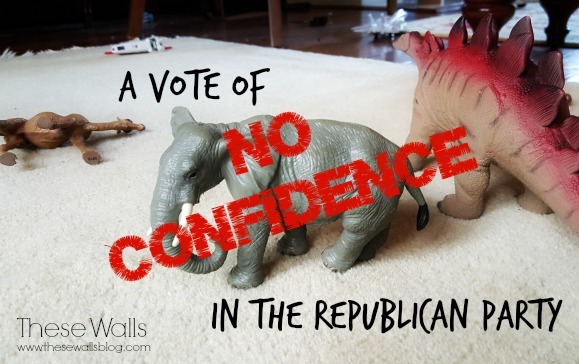 In this time of Donald Trump, this time of discontent and proud disloyalty and redrawn lines, who can say what the Republican Party stands for anymore? I have no confidence that the Party that will be on the ballot in November will in any way reflect my values or my priorities. So no, I won’t pledge to support the Party’s eventual nominee. I’m tired of feeling bound to a group that seems more scattered, more angry, more dysfunctional every year. Has it really been a full week since I’ve posted? Nah… can’t be. At least it doesn’t feel like it, because I’ve been doing so much writing. (Which has felt great!) I was trying to get something out in time for last night’s debates, but I just couldn’t pull it off. C’est la vie. 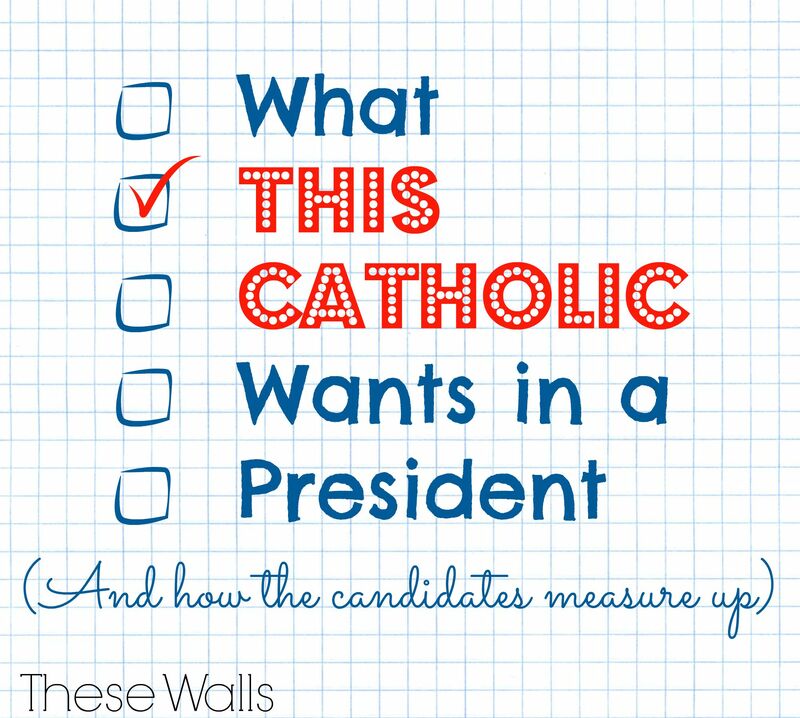 I’ll begin with a few posts on (you guessed it) what I want in a President and what my Catholic faith has to do with it. Then I’ll follow with several posts on (you guessed again) how I think the individual candidates measure up. 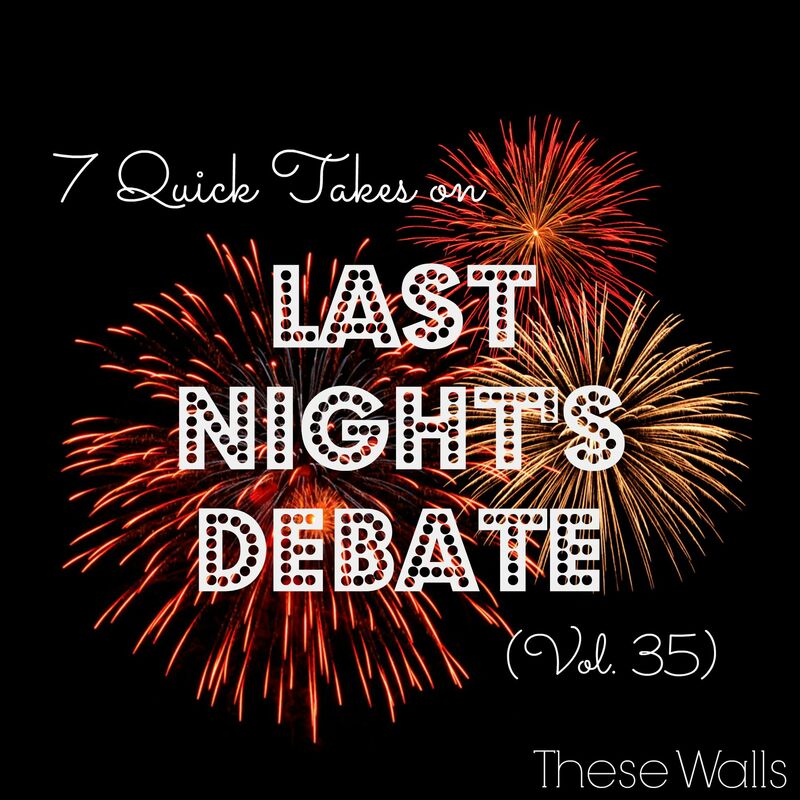 Now, on to this week’s 7 Quick Takes regarding last night’s prime-time Republican presidential debate. Of course Mr. Trump raised his hand. Good to have that out there in the open – he won’t promise, in the event he loses the Republican primary, not to run an independent campaign during the general election. Lovely. And it went on. I don’t think time was distributed quite fairly – a few candidates (namely, Ben Carson) seemed to get passed over for the more interesting-to-the-panelists candidates (including John Kasich, who barely made it into the group of ten, based on his poll numbers) — but I thought each candidate was asked fair, tough questions. There were some interesting exchanges and verbal tussles (namely, between Rand Paul and Chris Christie), and some great quotes and one-liners. In sum, I’m no fan of Fox News, but I was generally impressed with how they conducted the debate. I’m not opposed to the candidates being asked questions regarding their faith and how it plays into their policy priorities. (That’s kind of my thing here.) But the way it was phrased just seemed silly to me. And it probably seemed gleefully absurd to most Democrats. 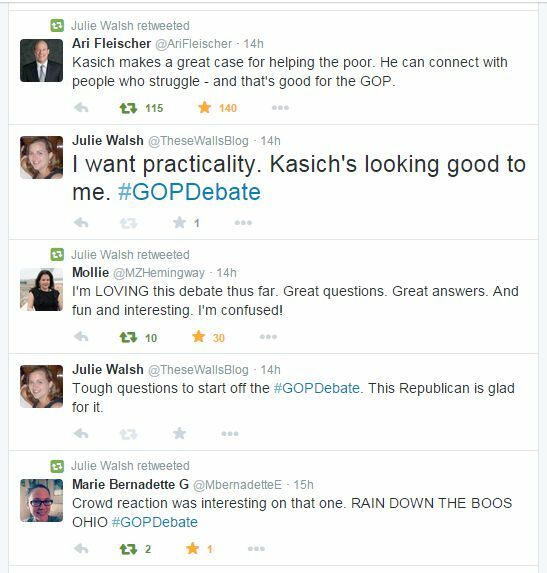 More fun than the debate itself, perhaps, was following along with others via Facebook and Twitter. I was taking notes on my laptop to prepare myself for writing this post and at one point I typed: “Okay, having a hard time keeping up here now because Twitter and FB are way too much fun.” They were! I’m honestly looking forward to the next debate. Marco Rubio. He looked great — came across as really composed and comfortable – “presidential”, even. He was articulate and on-point and made valuable contributions to the debate. I couldn’t help but relish the idea of him going up against Hillary Clinton in a general election debate. I went in liking the guy and came away more impressed than I expected to be. He might just have what it takes. John Kasich. I also went in liking him and he did not disappoint (except for maybe bringing up the fact that his father was a mailman a few too many times). He had good, well-put-together answers and came across as both compassionate and competent. We need a dose of both right now. Mike Huckabee. Again, I’m not a big fan. There’s nothing (or not much) I substantively dislike about him, but I don’t think he has a snowball’s chance in hell with the general electorate. 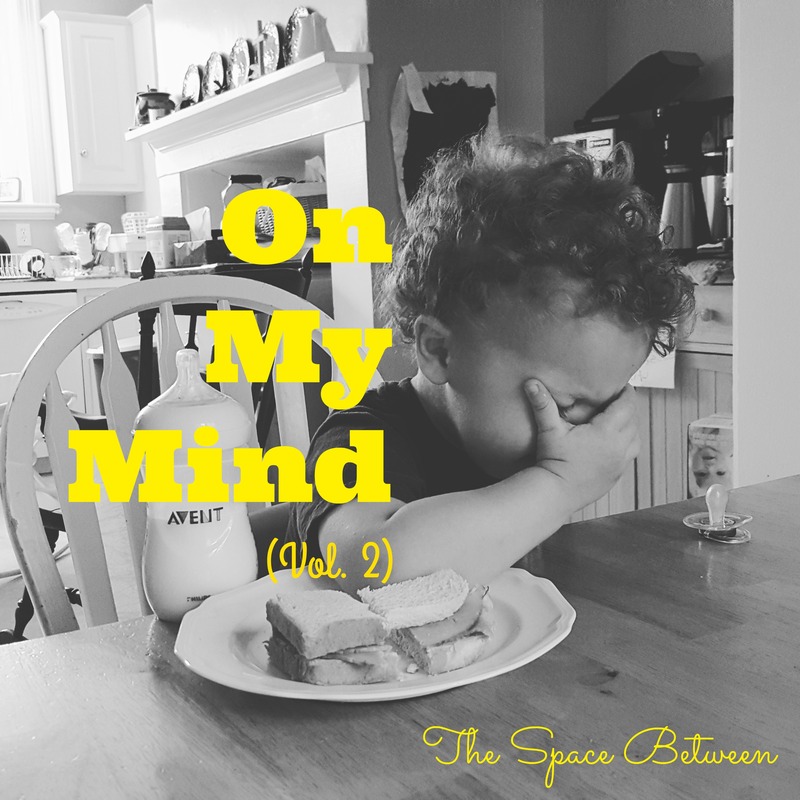 So, you know – why bother? But he did well last night. He looked more comfortable than any of the others (save maybe Rubio) – really in his element. And his responses were smart, colorful, and likeable. Rand Paul. Another one of whom I am decidedly not a fan. On him, though, it’s mostly a matter of substance – I’m just about as far removed from a libertarian as a Republican can come. The guy might be perfectly lovely – I don’t know and I honestly don’t care. To his fans, he probably came across very well. He spoke a fair amount, he got in several (seemingly well-rehearsed) one-liners, and he had a nice little tussle with Chris Christie. (All of which is why I’m putting him in the “winner” category.) But he still seems like such a niche candidate to me. I don’t think he translates any better to the masses now than he did before the debate. Ben Carson. This one surprised me. Being from Maryland, I’ve known of him (as a famous pediatric neurosurgeon) for years, so I’m naturally fond of him. But he’s a complete political novice (more so even than Mr. Trump, who excels in the politics of business and television), and I really expected him to flounder. He did nothing of the sort. He didn’t get much air time, but he used his opportunities well, coming across as intelligent and comfortable; he even seemed like he was enjoying himself. I didn’t love all his answers, but I thought he both held his own and made a generally favorable impression. His campaign has more of a future than I’d thought. Scott Walker. He could really go either way. His answers seemed solid, so I know some people will put him in the “winners” camp. But he just seemed so flat to me. I guess I had a more fiery impression of him, because boy, was I unimpressed with his demeanor. He did nothing to stand out and in such a large field of candidates, I think that will be a handicap. Chris Christie. Again with the going either way. He seemed very him on his answers, which his supporters will like. But he also seemed flat, which (again) surprised me, given his reputation. Moreover, I just don’t think he did much to win over the (sizeable) number of people who are lukewarm-to-hostile on him. I was kind of bored with his contribution. Donald Trump. I just cannot stand that man. He was obnoxious and his answers were shallow and abrasive — exactly as I had expected. But I’m still shocked that as many people like him as they do, so who knows — what I saw as the height of annoying they may have seen as appealing. I have no idea. I give up. Jep Bush. I like the guy – I always have. But for all his experience and money, he has a HUGE hurdle to overcome, given his surname. (I mean, while writing this I accidentally typed “George Bush.”) And I don’t think he performed nearly well enough to begin to move past it. I thought he looked uncomfortable and out of his element. It was painfully obvious just how long it’s been since he’s participated in a debate. 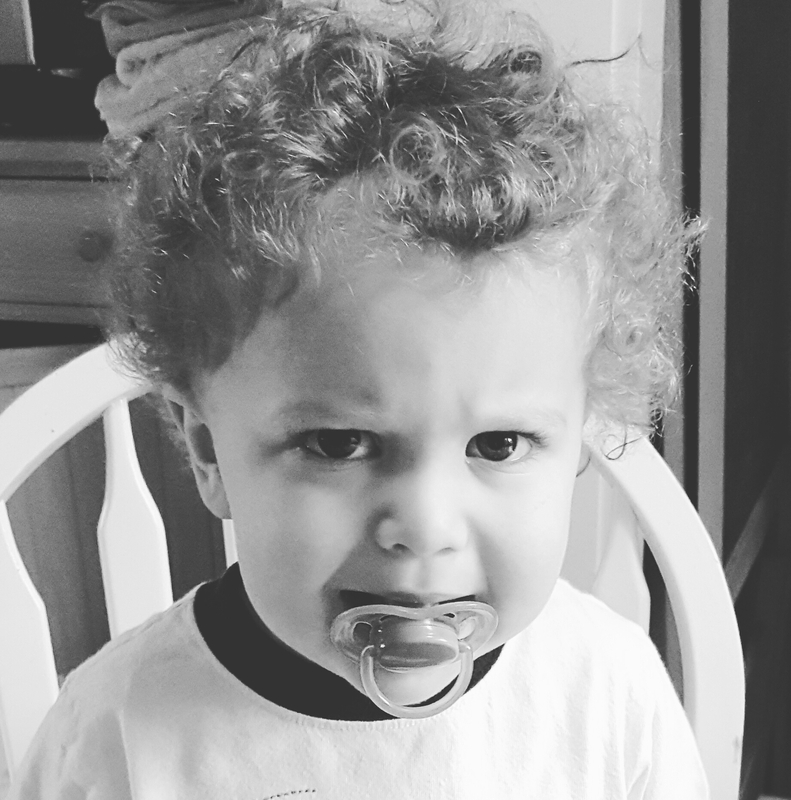 Worse, his answers were just kind of okay and he didn’t seem to exude any of his brother’s joy or energy. He struck me as a candidate from another, less interesting generation. I walked away thinking of him as a less formidable competitor than I expected. 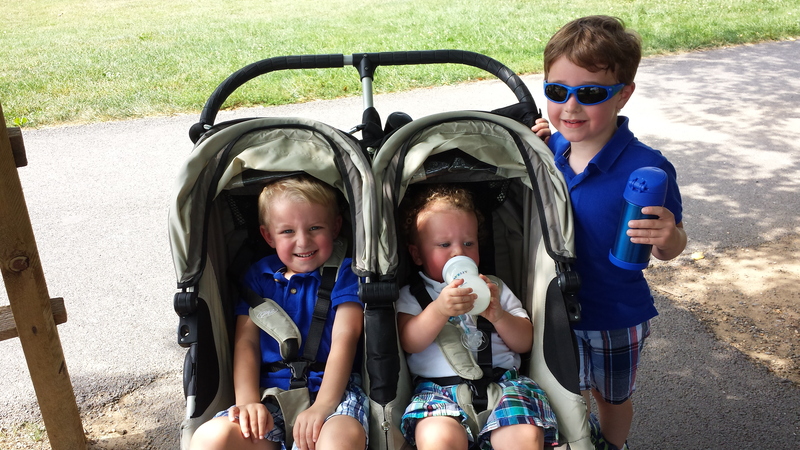 I didn’t get to watch the 5pm, second-tier debate (witching-hour viewing with three boys under the age of six? not gonna happen), but I’ve heard that Carly Fiorina did really, really well. I’ll have to check it out. I know very little about her. You know I’ve got to say something more about Trump. He dominated in the run-up to the debate and maybe he’ll dominate in the wake of it, but I’m glad that he didn’t get more air time during the debate than he did. Because just the idea of Donald Trump was so distracting to me, I had a hard time focusing on the others. As for those I’m more favorably disposed to, I went in liking Bush, Rubio, and Kasich, but I wasn’t sure if any of them really had what it takes. Based on their performances last night, I’m less sure than ever about Bush. But I’m more hopeful than I expected to be about Rubio and Kasich. I plan to look into them further. Both strike me as pragmatic and positive, and compassionate to those who are struggling. It’s a good start. 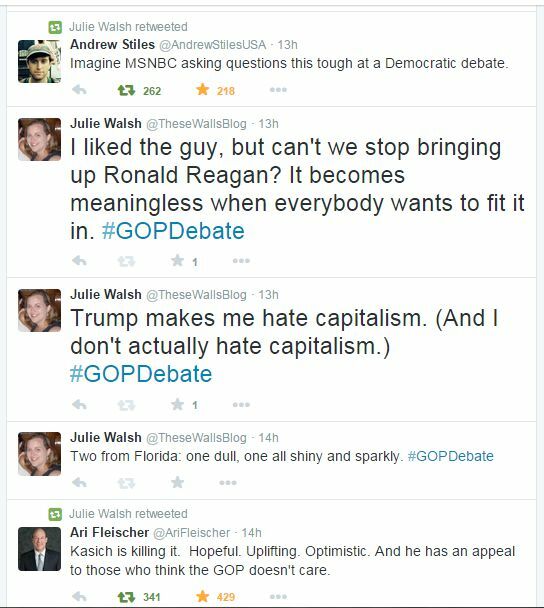 Thanks for indulging my poly-sci-major giddiness about yesterday’s debates. I hope you’ll come back next week for the beginning of my little series. And I hope you’ll head over to Kelly’s today to check out the other Quick Takes! Have a great weekend! I thought this little ‘disclosure of my biases,’ as I think of it, would be useful for a few reasons: (1) Political and religious subjects can be pretty touchy. (No surprise there.) (2) Our opinions on them usually have a strong basis in our own life experiences. 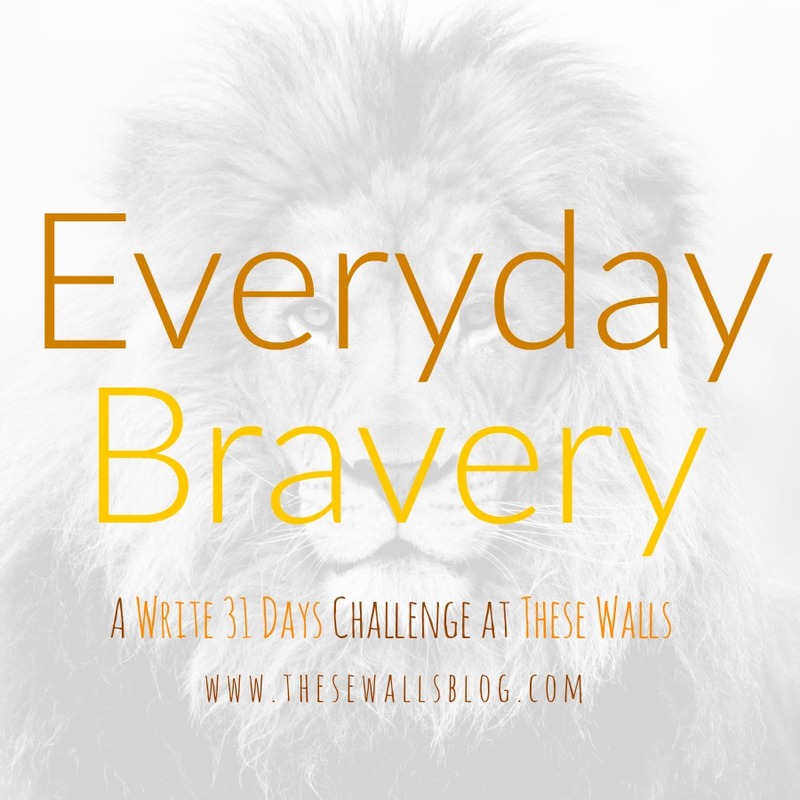 (3) I aim to be as fair, open, and even-handed on this blog as I can be. And (4) I personally prefer news and commentary sources that either (a) represent both sides of an issue equally well or (b) openly disclose their opinions and make no pretense of impartiality. So I kind of thought I’d cover all my bases. But before I go any further, let me say that this post makes me nervous and I had a hard time writing it. (Which is part of the reason I wrote so few posts this past week. I was trying to take this one in a different direction and it stumped me.) The words below represent my past and my thought processes and my faith, family, and friends, and it’s all very personal. It’s also probably a big ol’ case of TMI. But I felt like I needed to get all this out there before I proceed with a bunch of other posts I have lined up in my head. I was raised Catholic in that I regularly attended mass with my mother and I was provided with a religious education through our parish. But my father is not Catholic and there was little mention of faith in our (very happy) home. These days when I read blogs that mention a devotion to this saint, or a fondness for that novena, or a special attachment to such-and-such prayer, or a thousand little ways to live out the liturgical seasons, I feel kind of lost. Like I don’t fully fit into a community that should be my own. Yes, I’m Catholic. Yes, I love Christ, I am devoted to His Church, and faithful to its teachings. But no, I’m not familiar with all the trappings of my Faith. In my (public) high school I had a great group of smart, articulate, and religiously/politically diverse friends. And we liked a good debate. As the sole practicing Catholic and one of the only conservatives, I became the defender of all things Catholic and some things conservative. Just as my family’s experience as members of a minority party had prodded my attachment to conservatism, so my lunch-table debate experience bonded me to my Faith. Not that I understood it very well: eight years of Sunday school and one year of confirmation class do not a well-informed Catholic make. But my own little role as Defender of the Faith prompted me to research, ask questions, contemplate, and pray. This all set the stage nicely for my next step: a political science major at a Catholic college. More lunch table discussions, this time with classmates and seminarians who had been raised in devoutly Catholic families, gave me glimpses of the depth and beauty awaiting me in the Church. Philosophy and theology classes helped me to better understand it. And my political science courses, not to mention informal discussions with friends and professors, gave me an appreciation for the broader context in which we live out our religious ideals. I had always been interested in the convergence of differing ideas; in college I became particularly interested in the convergence of politics and religion. 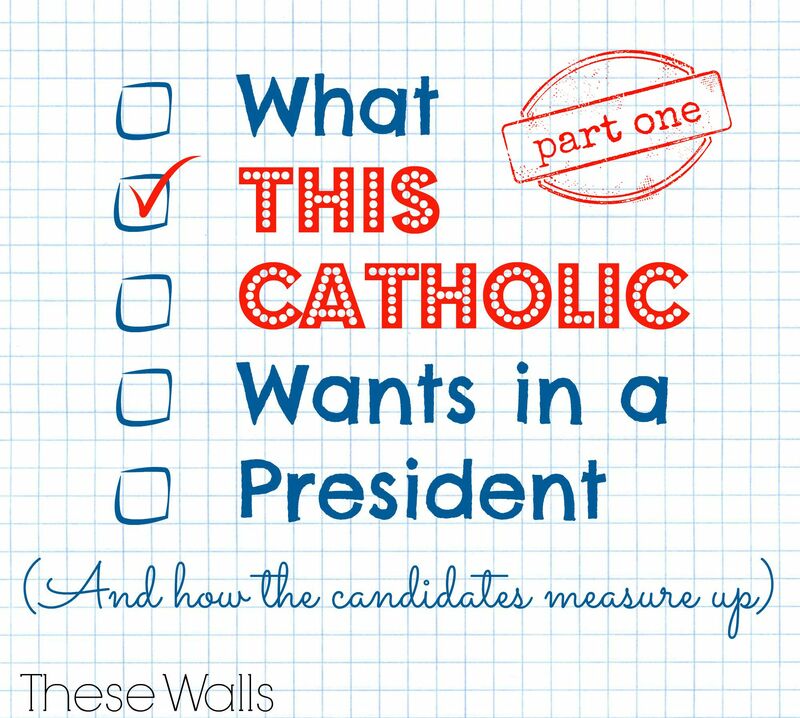 I wrote my senior thesis on “The American Catholic and the Two Political Parties,” which explored the poor fit between the Church’s teachings on matters of public policy and the ideological break-out of today’s American political parties. I also completed an internship with a Catholic organization that advocated on behalf of the Church’s public policy interests. Several years later, after a stint with the federal government, I returned to the organization to work as a lobbyist for the Church. There, I was tasked with representing the Church’s positions on social justice matters, which included a wide range of issues related to poverty, housing, health care, and immigration. (Along with a few others.) Most of the positions were what Americans would call “liberal.” Which was a real challenge for me. 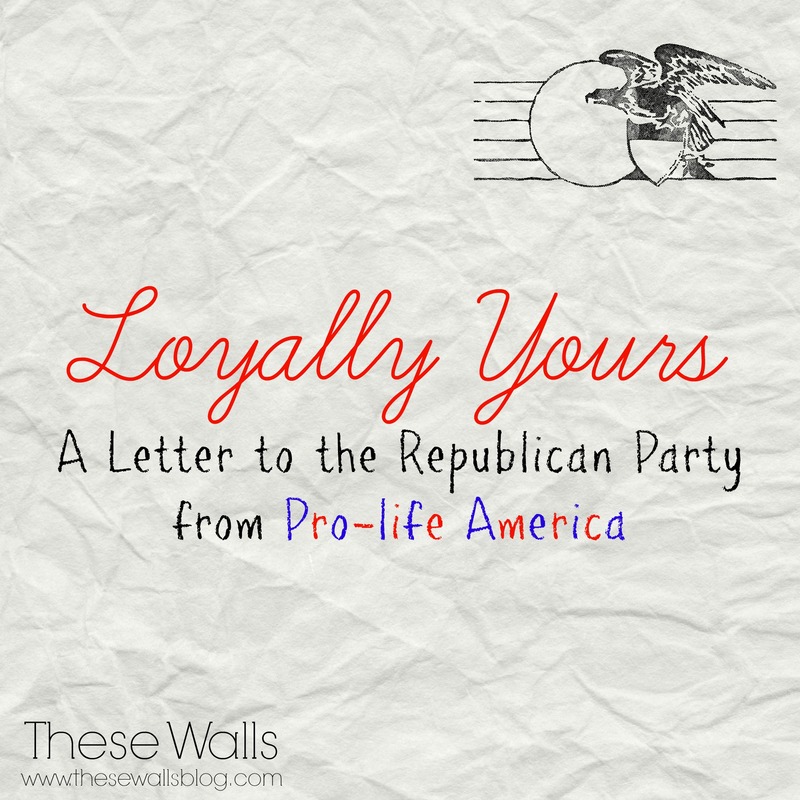 Coming from a conservative background, I was comfortable with the Church’s teachings on abortion and marriage. I was comfortable promoting school choice. But the Church’s social justice teachings made me uncomfortable. I didn’t necessarily think they were wrong; it’s just that they challenged the political ideals under which I was raised and so they caused discomfort. Oh, what a learning and growing experience it was for me. I read and I talked to people and I prayed. I began to gain something of an understanding of people who faced challenges that I never had – people who struggled to feed their children and keep a roof over their heads, people who came to this country seeking a better life, people whose poor health or poor treatment by others or whose own poor decisions had stymied their chances of making it on their own – and even people who struggled to be able to function in society at all. I was changed and I was humbled. I was grateful for the opportunity to give voice to these people’s concerns – and also for what I felt was an opportunity to bring people closer to Christ through this work of His Church. I feel like a cheesy ball of mush writing this, but I had so many moving experiences doing this work: I huddled in a group of elderly immigrant women and tried to convey to them (through our language barrier) that their Church was there for them. I spoke to crowds at parishes and pleaded with them to connect their own preferred cause for the “least of these” with another that was more challenging for them. I testified before lawmakers and told them, time and again, that all human life has value, regardless of its age or station. Perhaps I have digressed. What I’m trying to explain is that, yes, I come from a particular place on the political spectrum. I get the conservative thing. But I have also been emerged in an unfamiliar (liberal) political territory, and I got to know it too. I feel richer for the experience. When I was a lobbyist, I found that I could lobby more effectively when I put myself in the shoes of my opponents – imagining and even empathizing with their motivations. I think the same holds true when you’re discussing a difficult subject. All too often these days, people seem to regard consideration of and empathy with “the other side” as a sign of weakness, even foolishness. But it is such an asset. Sure, it helps you to build a solid case for your own cause. But more importantly, it helps you to explore your own opinions and motivations and be sure that you’re on the right course. When you get together a group of people who all bring this kind of consideration to their conversation – well, that kind of discussion moves everyone forward in understanding. That is what I feel my background has prepared me for and that is what I hope to encourage with this blog.